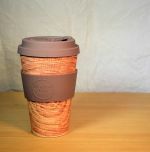 Eco friendly, Bamboo fibre, reusable takeaway WANDLE - SMALLER SIZE 12OZ ecoffee cup. Light yet sturdy and durable & in these stunning William Morris designs. 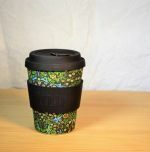 The William Morris designs ecoffee cups are dishwasher safe(cup only) and are finally recyclable when you have finished using in in a few years. At that point it can be crushed and soaked in boiling water then buried in your compost heap! 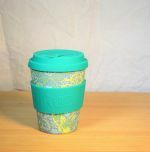 The lid and sleeve can be recycled with your curb-side recycling. 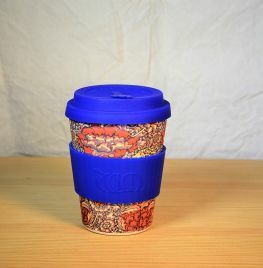 The William Morris designs versions of the ecoffee cup feature a stopper in the lid which helps prevent spills, and to keep your drink warmer for that little bit longer. 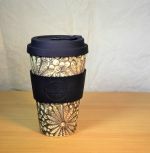 The sleeve is a design providing added insulation between the mug and your hand. 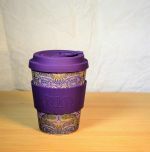 The capacity of this ecoffee cup is 12oz.